A Sultana, or Odalisk. Odalisque of the Sultan's Harem. Home » A Sultana, or Odalisk. Odalisque of the Sultan’s Harem. A Sultana, or Odalisk. Odalisque of the Sultan’s Harem. Odalisque of the Sultan’s Harem. THE Seraglio (Serail) itself, of which this female is a principal inhabitant is an irregular building of vast extent; and contains in all at least six thousand persons, many of whom indeed live in the city, and go there only during the day. It is not, in its extended sense, confined to the female apartments, for within its walls there are six large divisions for the divan, halls of audience, and various other departments; besides very extensive gardens. The grant gate of entrance is called Baba-hoomajun, or Sublime Porte; which is now also applied by foreigners to the Sultan and his government. 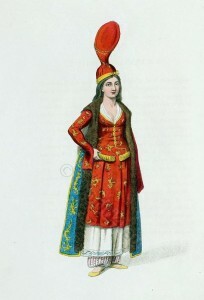 The females of the Seraglio consist chiefly of Georgian and Circassian slaves, and are of course admitted when very young. It is a custom among the great men to present the Sultan with virgule slaves, through the hopes that these may hereafter promote their interest. 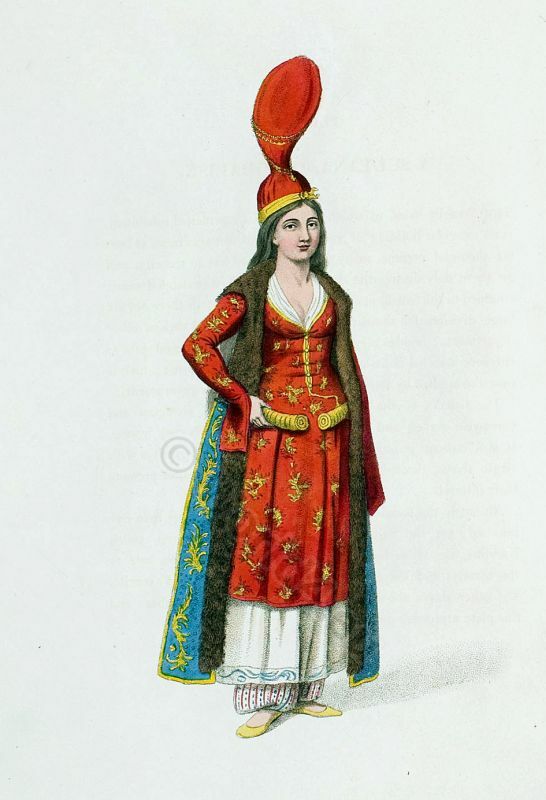 Although the females in the Seraglio amount to more than five hundred, yet the Sultan generally chooses six or seven, called Kaddins, who alone have the privilege of producing an heir to the throne; and the first who has a san is styled the Favourite. The other slaves are styled Odalisks, from Oda, a chamber; and this plate represents one of these.